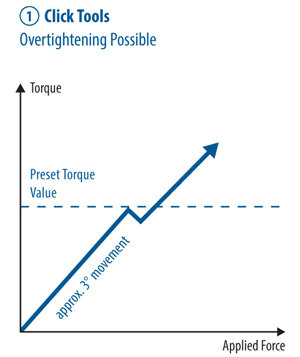 When the pre-set torque value is reached the operator will hear a click, feel an impulse and there will be approximately 3° of tool movement. Resetting takes place when the hand pressure is released. Work can then immediately continue. These tools are generally length dependent (exception DREMOMETER models AM - F) the position of the hand on the tool alters the torque produced. Continued application of force after the 3° of movement will cause the torque applied to increase above the required pre-set limit. 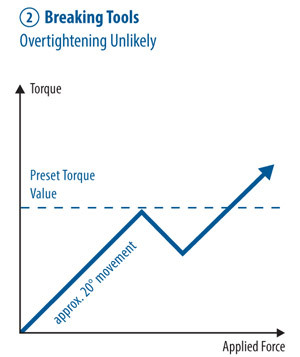 When the pre-set torque value is reached, these tools break at a specific point along the tool’s length - usually at a pivot point near the tool’s head. In most cases the movement is approximately 20°. The tool is automatically reset by allowing the handle to return to its in-line position. These tools are length dependent - the position of the hand on the tool alters the torque produced. Continued application of force after 20° of tool movement will increase the torque applied above the preset limit but with the greater angle of tool movement this is less likely. 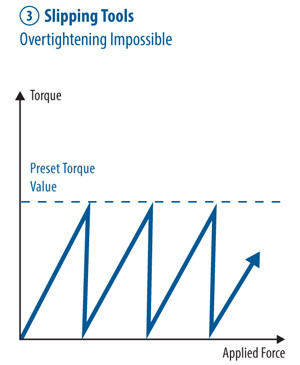 When the pre-set torque value is reached, a mechanism in the tool causes the application of torque to cease and the tool slips free for a short time until resetting occurs. Even if the application of force is repeated, the pre-set torque value will not be exceeded, therefore making it impossible to over tighten a fastener. These tools are not length dependent.